Life as a mermaid can be suffocating. Eviana Dumahl has returned home as a clan leader, an orphan, and a heartbroken teenage girl. Her parents are dead and her boyfriend, Brendan, has decided that he needs some time away. While battling her inner turmoil, Eviana is forced into the war that Lucian Sutherland has incited amongst her own kind. With the help of Kain, her friend and formally betrothed, the two work together to prove that they deserve their birthrights as young merfolk leaders. When the Council requests a demonstration of Eviana's mermaid powers, she finds herself with an opportunity to win back Brendan's heart. But her orders to train with a repulsive merman and the presence of an attractive new suitor challenges Eviana to embrace her leadership and resist temptation. Lucian is after her, and no one seems to understand why. Loyalties are tested as the casualties increase, showing Eviana that sometimes it is impossible to delineate between friends and enemies. Betrayal is the second book of The Syrenka Series trilogy following Eviana and her friends as they navigate through the challenges of existing in a secret world. Their demeanor was all serious and I probably should have been more concerned. However, at this moment I could've been running barefoot through burning coals and broken glass and it still wouldn't have dampened my mood. "Afraid so, tart." I elbowed him in the ribs and he seemed to be genuinely hurt. "I'm not your tart," I replied, imitating his earlier comment to Jeremiah. Apparently I was most attracted to what I shouldn't have. First it was Brendan, although he wasn't a bad boy per se, he just wasn't what everyone wanted for me. Now it was Graham - the prodigal Council member who loved his woman and his booze. Not to mention he had immense powers no one single merman should have. He was dangerous. And I was smitten. 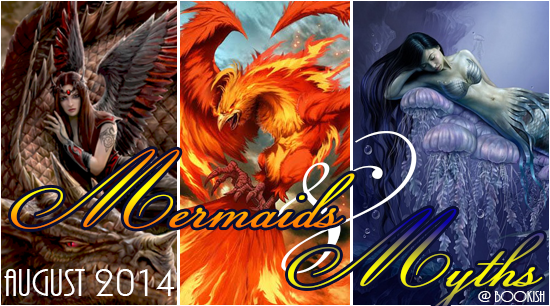 This is another top Mermaid trilogy for me. 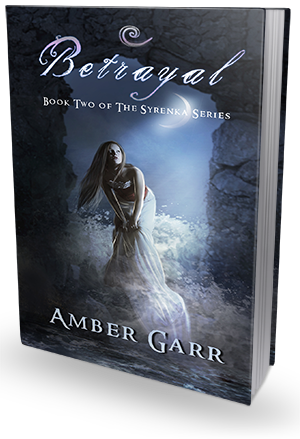 I realize that this is only the second book, but author Amber Garr shows no fear in making change. This book albeit being slightly more heartbreaking, but was just as amazing as the first. The changes were mind blowing, in both a good and bad way. Garr's writing once again captured me right away and there was no coming up for air until I was finished. This is not an abnormal occurrence when it comes to Garr and her books, but the Syrenka series stands above the rest for me. All expectations were exceed, even if some dreams were crushed getting there. What I love above all else in these books is the detail and emotion. It is beyond easy to fall into the world. Though I highly recommend picking up book one before picking this one up, you could easily just pick this one up and see everywhere that things happen. It is breathtaking at times and I forget that these are places I have never seen before, and just simply feel that I am there. The pacing is also fantastic. There is not a single moment that passes throughout the book that there is no action or turn of events. There is something new waiting around every corner and a twist that I don't think I could have seen coming if I tried. All of this made for a spectacular story that left me needing to pick the third book(which is in my possession). Eviana is really growing. She is now trying not to be ruled by impulses and her emotions, she's going for responsible in her new role. This isn't to say that she does mess up and boy were there a couple of times I wanted to shake her, but at the same time I understood. She is making forward movement but there are things in her past that are dragging her around. I don't mean back, I mean right around and even with all of her power the people that should be helping her learn, are jerking her around. The ones that she should be worried about, seem to be the ones that are helping her. However, everything is also not as it seems for this girl, but nothing ever has been really. The fact remains though, that my love for this girl is growing along with my respect. Where the romance is concerned, I don't really know what to say. There is no doubt that it was there, it was just a matter of where you focused. This is hard to describe without giving spoilers. Because last book was filled with all kinds of turmoil by the end, there is not much I can say here that wont give away what happened there. I can say there is some love returned, some lost, some wishful and the last is an indecision. Though all of these relationships have meaning to those that they are affecting, they are ultimately eclipsed by what Eviana wants the most. However, as far as what she wants and what Garr is going to give her... We will just say that there is a minor character to author disagreement going on. The Syrenka trilogy has not let me down. From book one, to book two I have been completely entranced. The character growth is phenomenal, and the twists and forward movement of the books has me convinced that my life was missing something before I read these books. For some the romance may be a little much, but keep in mind that there really only is one choice and honestly if you think about it, it's all realistic! When has anyone not felt attraction to someone else, you may not act on it but we are animals after all :) Pick these books up if you are looking for a Mermaid read that will engage you right from the start.